Staphylococcal scalded skin syndrome (SSSS) is one skin rash that affects children (newborn to 5 years old), caused by infection from certain strains of Staphylococcus aureus bacteria. The bacteria produces toxins (epidermolytic toxins A and B) that bind to a molecule within the part of skin cell (demosomes) that adhere skin cells together. The damaged desmosome cannot continue to adhere skin cells and the skin break up, leading to fluid filling in the spaces (blisters) and peeling skin. What Causes Staphylococcal Scalded Skin Syndrome? 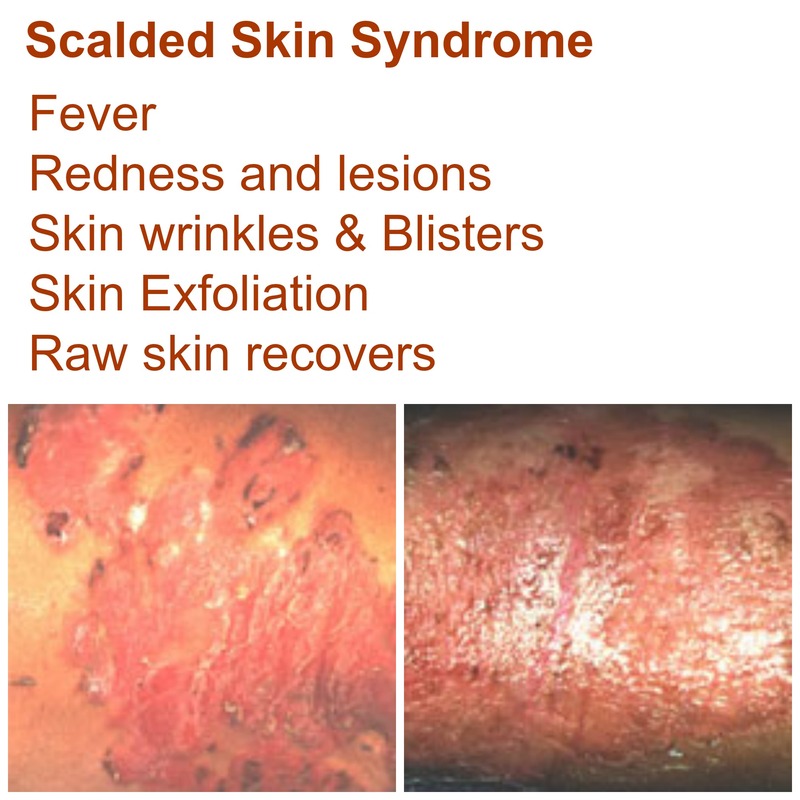 Staphylococcal scalded skin syndrome is caused by certain toxic strains (exotoxin of group II, phage type 71) of the staphylococcus bacteria found on skin. However, when there is broken skin from scratching, cut, a minor infection that can escalate to SSSS in children and in people with weakened immune system or renal insufficiency. Physical examination is often sufficient to diagnose SSSS. Where unsure, other tests like skin biopsy, blood tests may be ordered. Followed by skin redness and formation of lesions – for infants, lesions often start at diaper area or at umbilical cord (triggered by other conditions such as purulent conjunctivitis, nasopharyngeal infection or an infected umbilicus). For older children, usually the flexural areas and skin folds like the face, mouth/nose, neck, groin and armpit (triggered by impetigo or infected eczema or wound infection). Peeling of outer layer skin (Exfoliation) – Revealing red, raw and wet skin. The outer skin falls off with gentle pressure, known as the Nikolsky’s sign. With SSSS, the child will feel pain at the skin and experience fluid and heat loss via exposed skin. Therefore, treatment will include caring for the child in a warm environment with minimal clothing. Pain control such as analgesia and paracetamol may be given to the child. The child should drink extra fluids to replenish the excess moisture loss from skin and prevent dehydration (check weight and urine for signs of dehydration). Given the fragile skin, care must be taken when handling the skin to reduce trauma, such as when administering intravenous drips, creams and using non-adherent dressing to prevent further tearing of the skin. Moisturizer is applied to reduce fluid loss and soothe the skin until full recovering with smooth skin. Severe eczema presents higher risk due to broken skin (with scratching) and higher chance of staph bacteria colonization. For children who are treated promptly, there is a high chance of recovery without scarring (mortality rate below 5%). In adults, it can be life threatening. Other possible complications are cellulitis (deeper skin infection), sepsis (bloodstream infection) and pneumonia, though not common. Prevention of outbreaks in neonatal and nursery day cares are critical – adults who carry the bacteria (5% of adults) can spread to infants who may develop SSSS due to weaker immunity. Isolating the infected healthcare worker, hand washing and alcohol hand rubs should be practiced in the ward. Towels should not be shared. If you have experienced SSSS, do share in the comments, thanks!